JT Brubaker does not have any MLB stats for the season. Draft: 2015, Pittsburgh Pirates, 6th rd. Jonathan Trey Brubaker…Is a 2013 graduate of Tecumseh High School in New Carlisle, OH...Earned three varsity letters in baseball...Was also a two-time first-team All-Central Buckeye Conference and All-Springfield News selection...Pitched collegiately at the University of Akron, where he went 5-4 with a 3.63 ERA (89.1ip/36er) in 15 games (15 starts) as a junior in 2015...Led the Zips in strikeouts (72) and starts (15) while finishing second in wins (five) and innings pitched (89.1); also ranked fourth in appearances (15) for Akron in 2015...His father, Frank Brubaker, spent two seasons as a pitcher in the New York Yankees farm system, playing for Oneonta (New York-Penn League) and in the GCL in 1989 and with Fort Lauderdale (FSL) in 1990...Was signed by Pirates scout Trevor Haley. Was named Pittsburgh's Minor League Pitcher-of-the-Year after going 10-6 with a 2.81 ERA (154.0ip/48er) and 131 strikeouts in 28 combined starts between Double-A Altoona and Triple-A Indianapolis...Led all Pittsburgh minor league pitchers in ERA and ranked second in strikeouts...Began season with Altoona and was the Opening Day starter on 4/5 vs. Akron; had a no-decision (5.0ip/3r/1er) while recording eight strikeouts...Lost a 2-1 decision (5.0ip/2r) in second start on 5/11 vs. Harrisburg... Gave up three hits over 7.0 scoreless innings while winning his first game on 4/23 vs. Erie...Established a career high with 8.0 innings pitched on 4/30 at Richmond while also winning his second straight start...Tossed 13.2 consecutive scoreless innings from 4/18-30...Went 2-1 with a 1.45 ERA over five starts in April and ranked fifth in the Eastern League in ERA for the month; also led the circuit with 34 strikeouts and tied for the league lead with 31.0 innings pitched...Was promoted to Indianapolis on 5/10...Ranked sixth in the Eastern League in ERA (1.80), eighth with 35 strikeouts and tied for ninth with 35.0 innings pitched and a 1.06 WHIP at the time of his promotion...Tossed 6.0 scoreless innings while winning his Triple-A debut on 5/10 at Louisville... Tossed 8.0 scoreless innings while winning a 2-0 decision on 8/4 at Toledo...Went 4-1 with a 1.92 ERA (51.2ip/11er) over his final nine starts from 7/19 to 9/2...Went hitless in 14 at-bats between Altoona and Indianapolis. 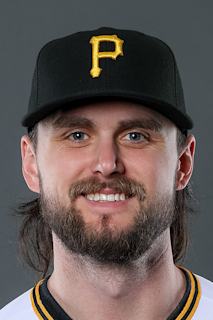 March 9, 2019 Pittsburgh Pirates optioned RHP JT Brubaker to Indianapolis Indians. November 20, 2018 Pittsburgh Pirates selected the contract of RHP JT Brubaker from Indianapolis Indians. May 25, 2018 RHP J.T. Brubaker assigned to Indianapolis Indians from Altoona Curve. May 23, 2018 RHP J.T. Brubaker assigned to Altoona Curve from Indianapolis Indians. May 21, 2018 Indianapolis Indians activated RHP J.T. Brubaker from the temporarily inactive list. May 17, 2018 Indianapolis Indians placed RHP J.T. Brubaker on the temporarily inactive list. May 10, 2018 RHP J.T. Brubaker assigned to Indianapolis Indians from Altoona Curve. May 16, 2017 Altoona Curve activated RHP J.T. Brubaker from the 7-day disabled list. May 4, 2017 Altoona Curve placed RHP J.T. Brubaker on the 7-day disabled list. Bilster on right index finger. April 5, 2017 RHP J.T. Brubaker assigned to Altoona Curve from Bradenton Marauders. June 23, 2016 RHP Jonathan Brubaker assigned to Bradenton Marauders from GCL Pirates. June 13, 2016 RHP Jonathan Brubaker assigned to GCL Pirates from Bradenton Marauders. June 8, 2016 RHP Jonathan Brubaker assigned to Bradenton Marauders from West Virginia Power. April 5, 2016 RHP Jonathan Brubaker assigned to West Virginia Power from West Virginia Black Bears. June 12, 2015 Pittsburgh Pirates signed RHP Jonathan Brubaker.